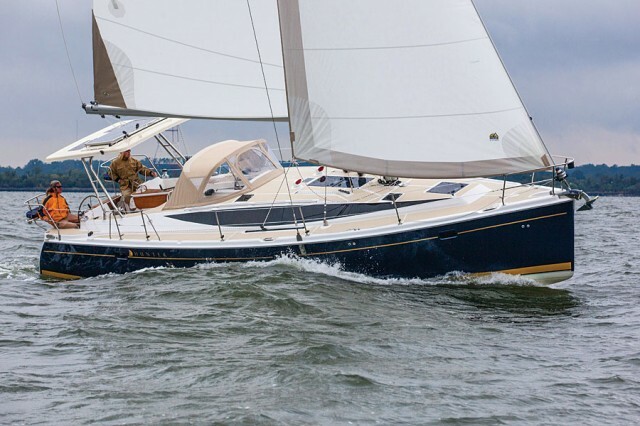 Hunter reaches out to offshore sailors with the newest edition of its 50-footer. Hunter Marine introduced the new Hunter 50 Aft Cockpit at the Annapolis boat show this year, where they took eight new orders between the aft and center cockpit versions of this design. 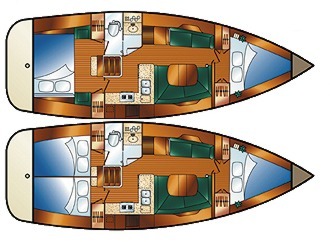 The sleek low cabin top, twin helms, and long, flowing lines of the 50 AC are a bit of a departure from the tiered mid-cockpit 50 CC sistership introduced last year, adding a whole new dimension to the boat’s potential target market. The long, flowing lines of the 50 AC add a whole new dimension to the boat’s potential target market. An additional counter by the companionway encloses the galley and protects the cook under way. 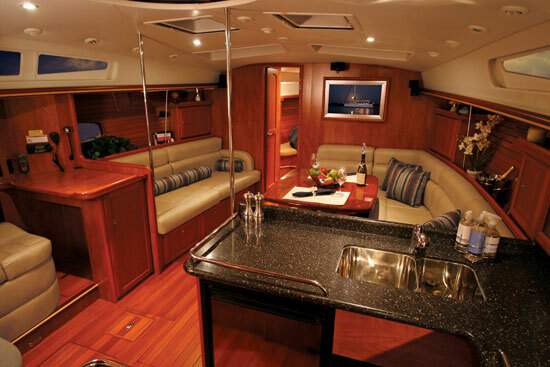 Step aboard via the swim platform and step-through transom, and you’ll find twin leather covered wheels from which visibility forward for sailing or docking is excellent. Two sheet winches on the coaming on either side are within easy reach of each helm, and there are two additional halyard winches and rope clutches on the cabin top at the companionway. 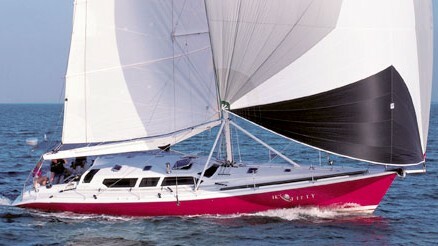 All the lines are led aft, and Hunter’s trademark arch and double-ended mainsheet allows convenient end-boom sheeting. The sizeable cockpit permits easy maneuvering and is trimmed with Flexiteek on the seats and sole for a traditional look without the traditional teak maintenance. Cavernous lockers under the seats and aft in two transom compartments make for excellent garage storage. A Corian-topped centerline table holds cool drinks and also provides a place to mount instruments visible from either helm. Much thought was given to the usability and ergonomics of the Hunter 50AC cockpit, and it shows, right down to the plentiful grab rails that ensure the safety of the crew. Moving forward is easy on wide decks with few tripping hazards or elevation changes. A watertight bulkhead backs up the sail locker, which is just aft of the deep, divided anchor locker, and the whole bow section is Kevlar reinforced for extra strength in case of a collision. Below the nearly 48-foot waterline, there is a spade rudder and a choice of two lead keels – a shoal draft (5' 6" at 12,600 lbs. ), or deep draft (7' 0" at 11,200 lbs.). The shaft driven Lewmar Mamba gearbox-and-shaft steering doesn’t require the maintenance of a cable system, and the Hunter 50 AC is powered by a three-blade fixed prop and a standard 75 HP Yanmar (which is upgradable to 110 HP). 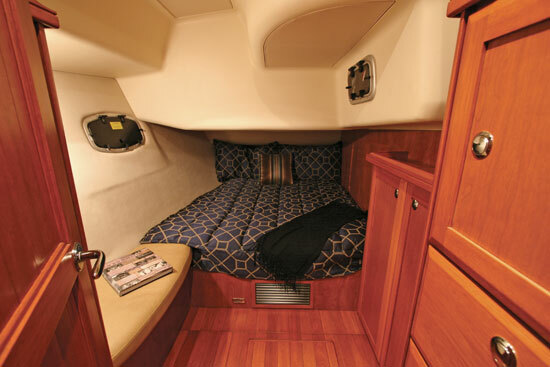 The Hunter 50 Aft Cockpit's master stateroom is forward with an island queen berth and inner spring mattress. The 50 AC is truly a BIG boat at 49' 11" LOA and a 14' 5" beam. 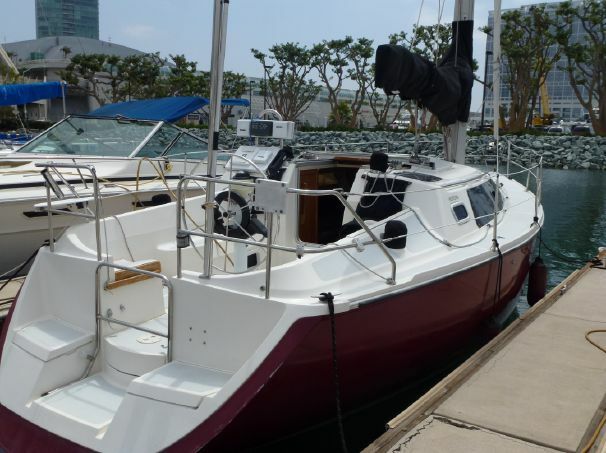 It was designed as a luxury cruiser, safe passagemaker and comfortable liveaboard. There is no doubt about the livability factor. 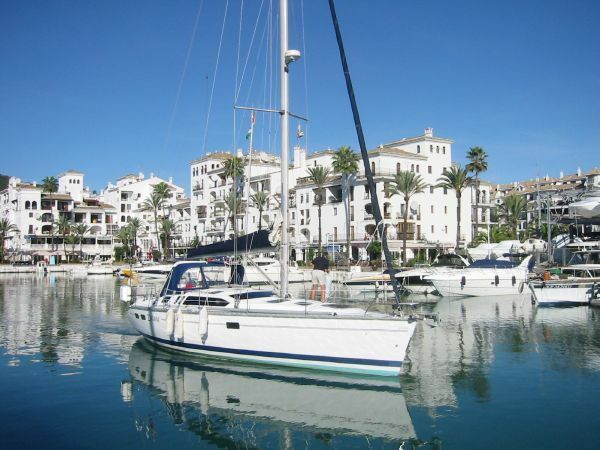 As for performance, it’s likely to mirror the 49, which sails well but has some challenges in light air and choppy water when it would benefit from more sail area, especially close-hauled. The sail plan needed to be designed to maximize efficiency to propel this 32,000-pound vessel, but it also needed to be manageable enough for Hunter’s emphasis on single-handed sailing. The B&R rig with double swept-back spreaders comes in two heights and a choice of standard or furling main. 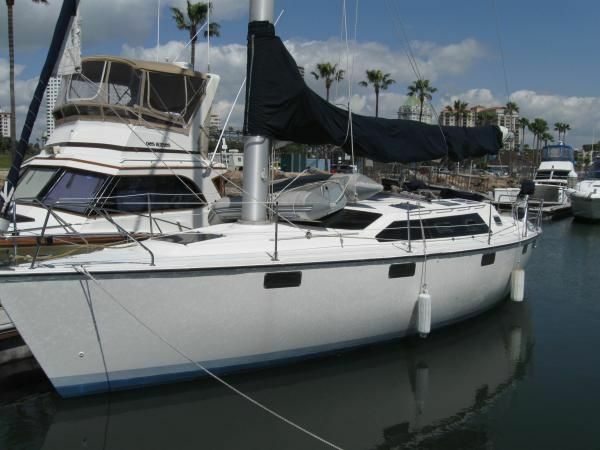 The standard mast is 63' 4" above the waterline and the optional tall rig adds another five feet. There are three options of headsail configuration – a single self-tacking jib, an overlapping jib or a self-tacking staysail, and an overlapping genoa. There is no backstay. The BIG feeling continues down below where the accommodations take advantage of the beam and voluminous hull that helps to create 6' 9" headroom despite a low profile from the outside. There is a choice of three layouts including twin cabins or a master in the forepeak. The saloon is finished with ash slats along the hull, teak cabinetry, and a low maintenance Everwear "teak and holly" sole. A U-shaped settee with a solid teak table on starboard converts to a double berth. 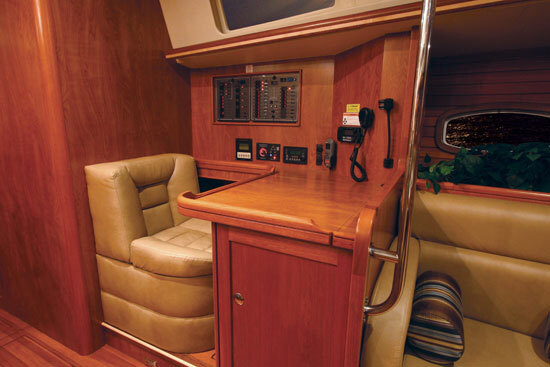 A straight settee is to port, just ahead of the forward facing nav station that has an adjustable navigator’s chair. There is plenty of room for Raymarine E-Series multi-function displays, and the chart table lid lifts for storage. The electronics display can also be output to the saloon’s 23-inch flat-screen monitor, for quick reference from just about anywhere. The chart table lid lifts for storage. Across on starboard is a nicely sized, L-shaped galley. An additional counter by the companionway encloses the galley somewhat and protects the cook under way. It has an efficient feel and features a 3.9 cubic foot refrigerator and a 1.4 cubic foot freezer. You can also add a front-loading fridge or wine chiller, which are nice but not terribly efficient on long passages. 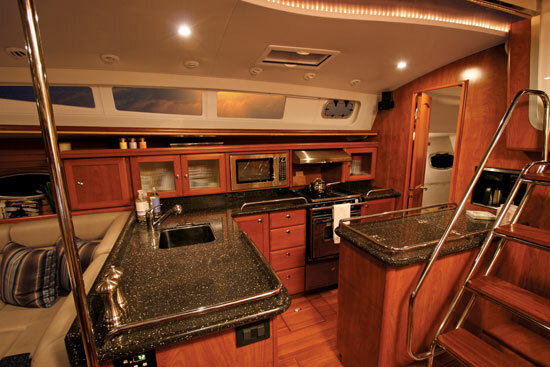 Twin sinks, a three burner stove, a combination microwave and coffeepot unit, and lots of Corian countertop space with stainless fiddles provides the chef with whatever’s needed to keep the crew fed and happy. Hunter’s signature dish-drying rack, featuring a fan and bulb to dry the dishes right in their storage space, will make the clean-up crew happy. Aft are two twin-berth guest cabins and a head with a separate shower stall. The port side cabin runs athwartships while the starboard cabin is fore and aft and has an optional desk and chair to form a kind of office or workbench that can also hide a washer/dryer combo. It’s a tight space, but it does what it was designed for, and that’s to keep the clutter out of the main living area. 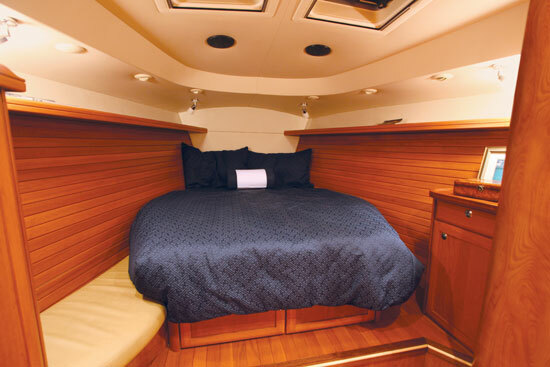 The master stateroom is forward with an island queen berth and an inner spring mattress. Two large, cedar-lined hanging lockers and drawers below the bed provide ample storage, and the ash slats are continued up here for a very sumptuous feel. A small vanity area with a mirror and a padded seat fill out the extra spaces between the split head, which has a shower stall to port and a head and sink to starboard. The four-cabin version stuffs two separate bunks into this area, which might be a good solution for kids’ quarters. The tankage includes 150 gallons of fuel and 200 gallons of water but the starboard water tank can be converted to fuel adding an extra 67 gallons, taking the 50 AC beyond the realm of a coastal cruiser. 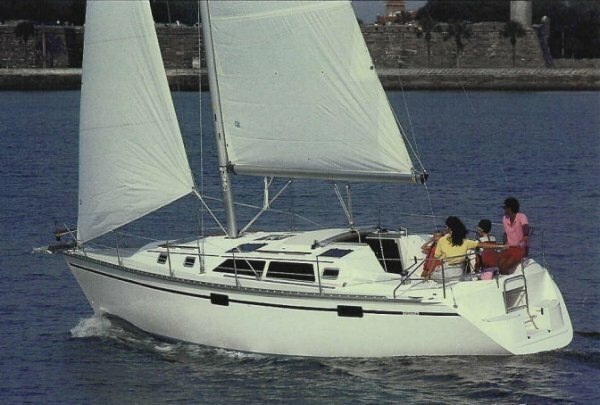 The options list is long, and one way to save money is to upgrade to the Mariner Package which includes items such as a 120 amp alternator, a bow thruster, vertical battens for an in-mast furling mainsail, upgraded stereo equipment, an additional front opening fridge, Memory-Foam mattresses, and an inverter. 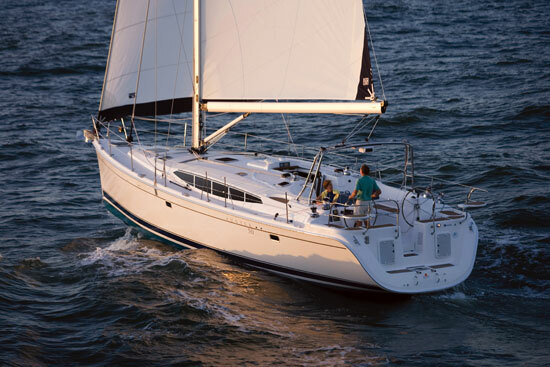 The base price of the Hunter 50 AC is $370,000, but with many of the upgrades available, sailaway can add $100,000 or more. Like its predecessor, the 50 AC is a modular build where the majority of the interior, including plumbing and electrical systems, is assembled on a structural grid and then placed and bonded into the hull which is solid, hand-laid fiberglass below the waterline and cored with end-grain balsa above. It’s a solid design which the manufacturer said they have tested by driving into the beach repeatedly at up to 9 knots, a testament to their focus on offshore capability. The Hunter 50 AC is a large, versatile platform that works for extended offshore cruising or as a truly big liveaboard. Either way, Hunter’s new ideas have given the 50 a fresh profile that is likely to bring new customers. Zuzana Prochazka is a U.S. Coast Guard Master with 20 years of boating experience. She is technical editor for Latitudes & Attitudes and a regular contributor to MadMariner. Her work also has appeared in Santana (where she previously was editor) and the Sunday magazine of the Los Angeles Times.